This is probably the earliest surviving Renaissance portrait medal. It shows the Byzantine emperor who travelled to Italy to take part in the discussions between the western and eastern churches in 1438–9. The image provided a prototype for an eastern ruler in exotic garb. Some early European depictions of Mehmed II show him in the same dress. Pisanello (Antonio Pisano) (b.ca. 1395; d. 1455) was born Pisa or Verona, by 1395. He was an Italian painter, draughtsman and medallist. His richly decorative frescoes, courtly and elegant painted portraits and highly original portrait medals made him one of the most popular artists of the day. He travelled extensively and worked for several Italian courts, at Mantua, Ferrara, Pavia, Milan and Naples. Many of his paintings have been lost or damaged, making a reconstruction of his career difficult. He is now better known as a medallist. Two-sided Renaissance portrait medals were a form developed by Pisanello, and commemorated individuals or events and functioned as gifts and mementoes. They were inspired by the Roman coins, with their portraits of rulers and allegorical representations on the reverse, excavated all over Italy and eagerly collected by humanist scholars. 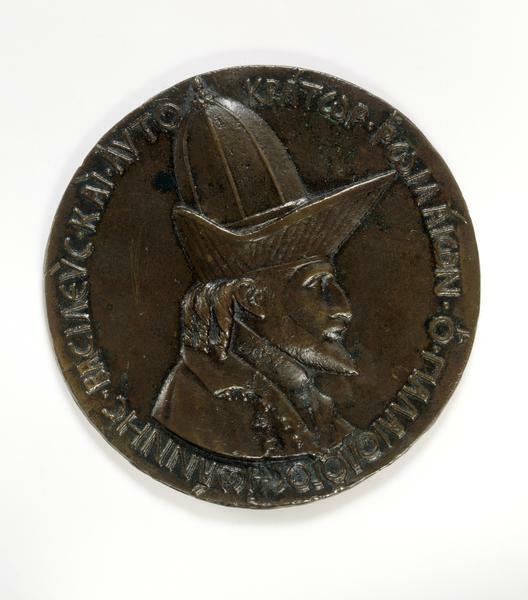 Medal in bronze of John Paleologus (1390-1448) Emperor of Byzantium . 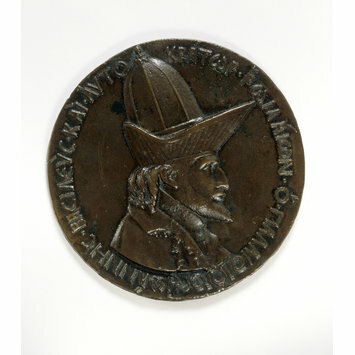 Obverse: bust to right of the Emperor, in a high hat with a peaked brim. Reverse: The Emperor on horse-back turned to the right stopping to pray before a wayside cross. To the left a page on a horse foreshortened from behind. Rocky background. The signature is given 'OPVS PISANI PICTORIS'. 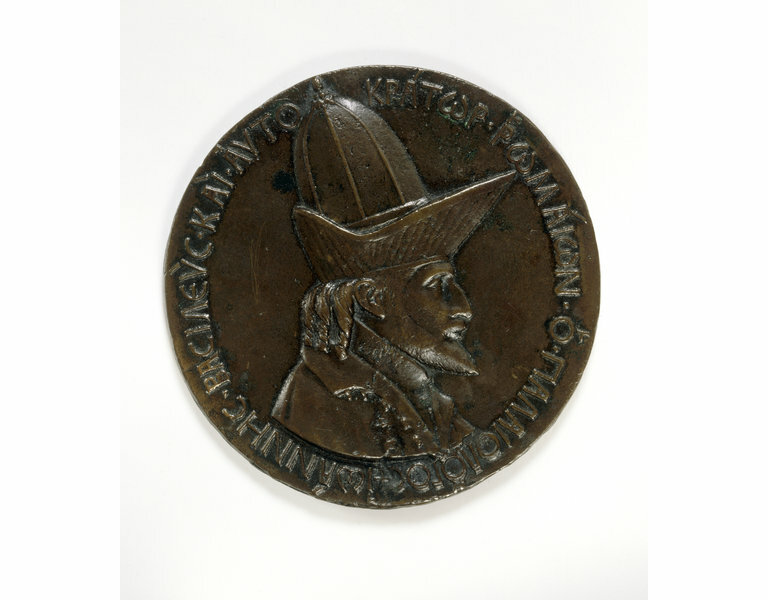 Waddington, Raymond B., 'Breaking News: Representing the Islamic Other on Renaissance Medals', The Medal, no. 53, autumn 2008, pp. 6-20.